The Japan Railway West Co., better known as JR West, will debut a Hello Kitty bullet train service on its Sanyo Shinkansen line, June 30th, 2018. At the moment, like other special shinkansen trains before, it seems that this train will run for a limited time, for now it’s not known until when but, according to JR West, it will be announced 4-month a time. 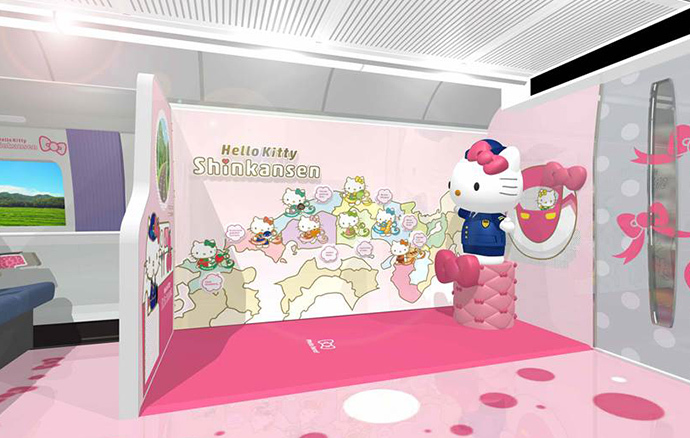 This new must-do item has chosen Hello Kitty’s iconic red ribbon as the main theme, as a way to represent the strengthening of the ties between the Shinkansen services and the western part of the country. The best part? It’s included in your JR Pass! Following the big hit character Evangelion train, that ran from late 2015 until May of this year, the new Hello Kitty-themed bullet train promises to be a worthy successor. The new adorable train will provide a Kodama service on the Sanyo Shinkansen line, which connects the western cities of Osaka and Fukuoka. The train will make stops at each station between Shin-Osaka and Hakata Station in western Japan’s Fukuoka prefecture, including Kobe, Okayama and Hiroshima, and will have some unique features. The first two cars will be decked out in full Hello Kitty adorable fashion, with motifs from the famous Sanrio character and her friends and even a photo booth! The first car, called Hello! Plaza, will not have any passenger seats, instead, it will showcase local specialities, delicacies, and souvenirs from the regions in the new JR West’s line, which passengers will be able to enjoy and buy. The second car named Kawaii! Room will be a passenger car covered from top to bottom with the popular Sanrio feline character and her friends, featuring a Hello Kitty doll in Shinkansen uniform. Besides, instead of the usual Shinkansen jingle, the train will ring the original Hello Kitty theme tune as it approaches the stations! JR West will highlight every region along the new bullet train’s itinerary. They’ve released eight original Hello Kitty designs holding a local delicacy from each of the places the train stops, like a green apple for Tottori prefecture, a strawberry for Fukuoka, and a black shell for Shimane prefecture. The first region to be highlighted is Sanin, home to the Shimane and Tottori prefectures, and Osaka, Hyogo, Okayama, Hiroshima, Yamaguchi and Fukuoka will soon follow. In Okayama Station, you can even get your Hello Kitty ekiben (shinkansen-shaped take away box)! The Hello Kitty Shinkansen is included with your JR Pass, so you can ride it for free as any Kodama shinkansen service. Though it is not necessary, we strongly advise you to reserve your seat, since chances are high it will be packed for the duration of its run. If you wish to ride on the very special train, especially car 2 Kawaii! Room, don’t forget to reserve your seat at any JR Office. The train numbers are Kodama 730 (Hakata to Shin-Osaka) and Kodama 741 (Shin-Osaka to Hakata). Please find below the Hello Kitty Shinkansen daily schedule (with train number) and all the stops and stations so you can plan your trip to purrrfection! Check out the Hello Kitty Shinkansen 2019 operating days calendar before your trip to ensure your Hello Kitty experience! In the following calendar you will find the operation days colored in pink. Hello, I’d like to ride the hello Kitty! shinkansen on 28th April. I have a Kansai+Hiroshima pass (5 days). Can I still book reserved seats? Otherwise, how do I do to guarantee a seat? i will be staying in tokyo , can i get on the hello kitty train in tokyo ? Hi John! 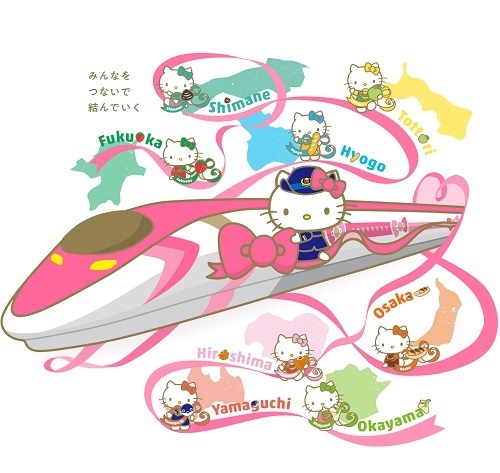 As you may have read in this article, Hello Kitty Shinkansen does not run any route in Tokyo. Happy travels! Hi! My mother and brother will be going to Japan later this year, by the end of September to early October I believe. I was checking the schedule for this as they were interested in the Hello Kitty Shinkansen and was wondering if there was a way to check what are the operating dates for it around then as it’s not included yet on the calendar on here. Hi Rona! Notification of the operation schedule from July 2019 will be made when it is determined. Hello, I live overseas and I will be traveling to Japan end of March and would love to take the Hello Kitty Bullet train on March 31. I have read several articles that you can reserve in advance but I haven’t found a link to do a reservation online. They all keep redirecting me to the JR pass. Is there a way to reserve online from overseas for this specific shinkansen or do I have to reserve when I get to Japan? I don’t want to miss this opportunity to ride this beautiful train. Thank you. 1. Please take your Japan Rail Pass to any JR Ticket Office (Midori-no-madoguchi), spread through all Japanese train stations. Alternatively, go to a Travel Service Center or a Travel Agency ticket sales office. 2. Once at the ticket office, you will be asked about your destination and preferred departure time. You can also look up the train times in advance, or get help from one of the friendly staff members to find the best option for your trip. 3. You will be handed your reserved seat ticket, stating departure time, arrival time, train name, car and seat. For example: Nagoya – Kyoto / 14:19 – 15:11 / Hikari 513, Car 11, Seat 5-B. Hi, does this Hello Kitty train runs from Osaka airport to Osaka City? Hi Jenny! The new Hello Kitty Haruka train is the one taking passengers from Kansai Airport to Kyoto passing by Osaka and Tennoji (also the route backwards). You can ride the Hello Kitty train for no extra cost with your Japan Rail Pass and you can also make a seat reservation for free. Happy travels! I will be traveling to Osaka soon, and I would love to take my children to catch the Hello Kitty Train, I had read a few articles on the train routes but I am still not sure if the train is available at the cities I will be visiting. Can you please help? We are planning to travel from Osaka to Kyoto and Nara, it would be lovely if we are able to catch the Hello Kitty Train. Thank you. Hi Jenny! In this article you will find a map which makes more clear the stops of the train. Kyotoand Naracannot be reached on the Hello Kitty Shinkansen. Happy travels! I booked the hello kitty shinkansen for Feb 2019. I get a seat on 6 cars. Is it possible to walk to the 1st and 2nd car while on board? Thank you. Hi Piepie! Yes, travellers are allowed to walk to the first two cars while on board. We hope you enjoy the cutest experience! I would travel to Jp in Aug 2019. When will be the schedule of Hello Kitty train announced? Thanks a lots. Hi Ching Yuet Lin! Notification of the operation schedule from July 2019 will be made when it is determined. Happy travels! Hi. Is there a rail pass for nagoya – osaka – kyoto – himeji – hiroshima line? Thank you. Hi Zorokun! The Japan Rail Pass grants you access to all described places. Happy travels! I will be in Tokyo 3/25 and in Osaka 3/27. I would like to ride the hello kitty train on 3/28. Should I book them when I got to Tokyo or wait until I got to Osaka. How full is this train? Hi Tantra! Hello Kitty Shinkansen is extremely popular and thus we recommend you to book your seats as soon as you reach Japan. Please note that in case you travel with a Japan Rail Pass, which includes the ride on this train, you need to have your voucher exchanged to be able to reserve your seats. Happy travels! I will go to Osaka on 6 – 10 March 2019. Can I ride Hello Kitty Shinkansen from Osaka using JR Wide Kansai Area Pass? Could you give me the schedule of Hello Kitty Shinkansen? Hi Lilyana! The Hello Kitty Shinkansen timetable is detailed in this article 😉 you will also find the operation days. Happy travels! I will get to Osaka airport. On 3/26 and I believe the pass does not cover train from airport to Osaka citi center so I have to buy separate ticket, right? What is the best way to get to city center? The next day we would like to take hello kitty train, do you think we will still have a seat ? You can activate your Japan Rail Pass either at the airport or in the city center. I will in Osaka end of March. Does hello kitty train run daily or just certain days of the week? Hi Nancy! March dates are not fully announced yet – so far, Hello Kitty Shinkansen has been confirmed to be running until March 10th, and it will be operating all ten days of the month. Further dates are yet to be announced – stay tunned! Hi Dem! Notification of the operation schedule from March 2019 will be made when it is determined, which should be very soon. Happy travels! Will there be new schedule from Shin-Osaka to Hiroshima with Hello Kitty train in April 2019? I would love to be able to reserve to go with my daughter. Hi CT! Dates later than March 10th will be announced soon. Stay tunned! Is there any chance this will be changed to a Tokyo to Kyoto Itinerary. Perfect for us foreign travelers to get back and forth. I have a party of 15 people, March 14, 2019. They would be crazy happy to ride this on that route. Is it possible for me to go for a day trip to Kobe from Shin-Osaka with Hello Kitty Shinkansen. Hi Mazurah! If you check the timetable in this article you will see you can travel from Shin-Osaka to Shin-Kobe at 11.29h. However for the return itinerary you will have to choose a regular Shinkansen, also included in your Japan Rail Pass. Happy travels! will it still be in operation in July 2019? how long does it take from Osaka to Fukuoka? Hi Ka! Notification of the operation status from February 2019 onwards is yet to be determined. Keep an eye on our article to make sure you don’t miss the updates! The Hello Kitty Shinkansen reaches Shin-Osaka at 11:29h and reached Hakata (Fukuoka) at 15:38h. Enjoy your stay! Hi, may I ask if I can buy a single trip ticket (for example from Shin Osaka to Okayama) and able to sit this Hello kitty Shinkansen? Without having to buy a JR pass? Can anyone confirm if the hello kitty train will still be in action and if so, how do I book. Hi Olivia! Operation of the Hello Kitty Shinkansen has been confirmed until February 2019. The ride is fully included in your Japan Rail Pass 😉 Happy travels! Hi! Just want to confirm that both Kodama 730 and Kodama 741 actually is the same Hello Kitty Shinakansen? Just in different direction? Yes! Kodama 730 goes from Hakata to Shin-Osaka and Kodama 741 from Shin-Osaka to Hakata. On the Hello Kitty! Train, they offer a Hello Kitty! Bento box set. How do you buy that???? I want to try one sooooo much!!!!! Hello, I would like to book from Hiroshima to Fukuoka on the 15th October – will it be too late to reserve seats on the 8th? that’s when I will be in Japan. I have a J Rail pass. Hi Eve! We don’t have the availability of tickets for the Hello Kitty Shinkansen, we recommend you to ask once you are in Japan since it is the only moment you will be entitled to reserve your seats. Happy travels! Hi, I will arrive Fukuoka Airport on 17 Nov 2018. When I arrive Fukuoka, I would like to book 19 Nov 2018 Hello Kitty Shinkansen from Fukuoka to Osaka. I bought the 7 days JR Pass. May I know where can I do the booking? If I make the booking on 17 Nov 2018 for 19 Nov 2018 travel from Fukuoka to Osaka, may I know the start date of my 7 Days JR pass will be from 17 Nov 2018 or 19 Nov 2018? The activation date of your Japan Rail Pass is the date you wish to start using your pass. Any date that is within 30 days of the exchange date can be selected as “Activation”, so it can be either 17 or 19th November. To reserve your seat please take your Japan Rail Pass to any JR Ticket Office (Midori-no-madoguchi), spread through all Japanese train stations. Alternatively, go to a Travel Service Center or a Travel Agency ticket sales office. Hello! Will this special edition be available again in 2019? I am planning a trip to Fukuoka in June 2019 and am looking forward to this. Hi Janice! Notification of the operation status from December 2018 onwards will be made when it is determined. Keep an eye on our article to make sure you don’t miss the updates! Yes, the Hello Kitty Shinkansen will be operating at least until November 30th. Please check the last part of our post for updated calendar and timetable information. I rode the Hello Kitty shinkansen yesterday Aug 25 from Hishi-Akashi to Okyama. As well as being cute it has a an extremely high standard of interior comfort, comparable to the Green Car on other services. I hope it will continue in service past October and I think other regions of Japan would welcome it. Hello, my family of four will be in Osaka at the end of August for 7 days and I am planning to purchase a 7 day JR pass. I understand that I can only book seats upon arrival In Japan, after exchanging the voucher for the pass. We are very much looking forward to ride on the hello kitty train. Would you please let me know whether it is easy to reserve a seat a day or two in advance? Or is there a way I could reserve ahead from outside of Japan? Thanks. Hi Ingrid! Unfortunately seats cannot be reserved before landing in Japan and exchanging your voucher into the Japan Rail Pass. Seat availability cannot be predicted. Happy travels! Hi, Will the Hello Kitty Shinkansen run on September 11th, 2018? Or where can I know the off dates of the train? Thanks! Hi Martha! You can check off dates at the train’s official website. In September 11th is will be operating normally, the off dates in September are expected to be 3rd to 5th and 26th to 28th (all included). Please note that as a result of operation conditions and other reasons, there may be occasions when sudden changes occur in train status and scheduling. Happy travels! Is this train run daily or there are days that the train do not run? Tried to reserve to car 2 and were told car 2 is not resereved. So I got tickets for car 4 instead. Is it really non-reservable, or was it a problem in communication due to language barriers? If it may be reserved, how can I try to change our seats? Also, if not, is it possible to visit cars 1 and 2, either at the platform or during the ride itself? thank you for your reply. Can we book and reserve our seats for hello kitty train after we exchange our standard blue JRpass at Haneda international airport We are arriving Sept 14. Planning Sept. 17 from Osaka station to Fukuoka station our Hello kitty train trip. Hi Eugene! Yes, you can book your seats upon exchanging the voucher at Haneda Airport. Enjoy your stay! hi I don’t know if my post comment got in. We will be there this coming Sept. 16 or 17 to ride the hello kitty train. Can book already and get our seats in advance after we buy our japan rail pass. can you give us a good advice. We are afraid we will run out of seat that day using the hello kitty train. How many hello kitty train schedule in a day from Osaka station to Fukuoka station. Hi Eugene! You will only be able to reserve your seats once your Japan Rail Pass is exchanged in Japan. There is one train per day running from Shin-Osaka to Hakata (Fukuoka), in this article you will find the times and stations. Hi this is Eugene again how is hello kitty train after this big typhoon that hit Osaka . Is the operation of hello kitty train still continue . We will ride the hello kitty train this sept. 17 from shi-Osaka to F ukuoka station. What is your advise to us. Is hello kitty train operational on that date . Hi Eugene! Sanyo Shinkansen Line doesn’t seem to be affected yet. However for the most updated status please visit the official website. According to the time table on this site, the Kodama 730 leaving Hiroshima on 8:13 arrives to Higashi-Hiroshima on 8:37. On the other hand, according to Hyperdia, the same treain reaches Higashi-Horoshima on 8:24. Which is the correct time of arrival? Hi NC! The table in this article provides the departure times; that is, according to it, the Hello Kitty Shinkansen leaves Higashi-Hiroshima at 8:37. It stays some minutes at each stop to allow passengers to board and exit the train. Enjoy your stay! USing JR PAss to ride on the Hello KItty SHinkansen train, is it a one way ride? I am from Shin-Osaka and want to go to Hiroshima can i go back on the same day from Hiroshima to Shin-Osaka? Hi Adlin! Please check the timetable part on this article. As you will see, 2 Hello Kitty services will run daily: Kodama 730 from Hakata to Shin-Osaka between 6.40 and 11.13h and Kodama 741 from Shin-Osaka to Hakata between 11.29 to 15.38h. Can I use the 5 day Kansai Wide Pass to ride the train? Hi Eugene! To get the price detail please check Hyperdia. Hyperdia offers detailed timetables, platform information, trip duration and exact distance, which will help you greatly in organizing your trips in Japan. Will the Hello Kitty train be in service every day till Oct.? Hi Ed! As detailed in this article, at the moment it is confirmed that this train will run until October 2018, when the company will announce either its continuance or the end of its run. It will run nearly every day. Enjoy your stay! Thanks for the reply! You said nearly everyday. Where can I find out it’s off days, as we are planning to ride it in Aug.
Hi, if I managed to book my seats in car 4, may I leave my luggage at my seats to visit car 1 and 2 for photos? Is JRail pass that is only good for daily use not 7 days on Hello kitty train. Hi Eugene! The Japan Rail Pass is a multi-use all-you-can-ride discounted rail ticket. It gives you unlimited access to all Japan Rail National trains, as well as JR bus services, ferry services, and airport transfers. Validity can either be 7, 14 or 21 consecutive days, and thus it is not possible to have a Japan Rail Pass for one single day. Hi, We will be there this coming Sept. My daughter like to ride your hello kitty train and tour your puroland sanrio. Can tell me what is the best way to go to puroland and get a train ticket of hello kitty train. is JR pass is applicable to use in hello kitty train and how to purchase the pass. Hi Eugene! Yes – as specified in this article, the Hello Kitty bullet train is included in your JR Pass. Tama-Center, the city of Hello Kitty, is about 30 minutes by train from Shinjuku and roughly 60 minutes from Tokyo Station. Access via the Keio Line from JR. Enjoy your stay! thank you for your reply. now we are booking our flight to Osaka international air port. Now my question are how can we get in to Shin-osaka station from the our air port can we buy a daily jr pass instead of 7 day jr pass to be use in hello kitty train from the air port. If we can how much is the daily jr pass. or direct us in the best way possible. We will still travel by train from osaka to haneda tokyo by train to see the Puroland in tama japan. Hi Eugene! Daily Japan Rail Pass doesn’t exist, this product can be for 7, 14 or 21 consecutive days only. This is so exciting!! The Hello Kitty train looks amazing! Could you tell me if the train will be running until the end of October? I will be in Fukuoka on October 28 until mid-Nov and would love the chance to ride on it. Thank you! Will this shinkansen still be operative in September? Also, can I book tickets in advance from home, or do I need to do it in a JR station in Japan? Hi Ori! As detailed in this article, at the moment it is confirmed that this train will run until October 2018, when the company will announce either its continuance or the end of its run. Enjoy your stay!